contain numerical denominators or denominators with simple monomial variables. A rational equation is an equation that contains one, or more, rational expressions. Remember: equations have equal signs. and gets rid of those pesky denominators. If the equation contains addition or subtraction, be careful to multiply each term (distribute) on both sides of the equal sign. 1. Perhaps the easiest type of rational equation to solve is the one that is expressed as a proportion (one fraction equal to another fraction). We simply treat the problem as a proportion and solve by cross product ("cross multiply"). Remember, that in a proportion, the product of the means equals the product of the extremes. 3. Distribute and solve for x. 4. Check in original equation. Now, the real work begins! (1) Identify the least common denominator (LCD). (4) Check the answer. VERY IMPORTANT! 1. Find the least common denominator. In this example, the least common denominator (LCD) is 6. 2. Multiply both sides of the equation by the least common denominator. Note the parentheses on the left. You need to distribute across the parentheses. Hint: You need to multiply each term by the common denominator. 3. Reduce and simplify each term. 5. 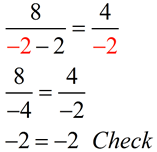 Check in original equation. Solving rational equations with variables in the denominators involves manipulating and rewriting the terms. These "new forms" of the original equation may produce solutions that do not work in the original equation. These answers are called extraneous solutions, and are not real answers at all. 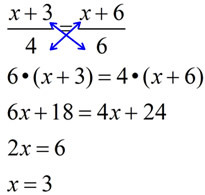 Always check your answer(s) in the original equation to be sure you do not have an extraneous solution. You will be working with extraneous roots in Algebra 2. 1. Determine domain values that will create zero denominators. 2. Find the least common denominator. In this example, the least common denominator (LCD) is 2x. Multiply both sides of the equation by the least common denominator. Note the parentheses on the left. You need to distribute across the parentheses. 5. Check to be sure the answer is not a value that caused a zero denominator in the original equation. 5. The answer is not x = 0, which causes zero denominators in the original equation, so our answer is a valid solution.